"The Escape of the Magic Carpets"
These "magic carpets" were draped in the window of an oriental carpet store on the Avenida Acala, a pedestrian only street in Oaxaca, Mexico. 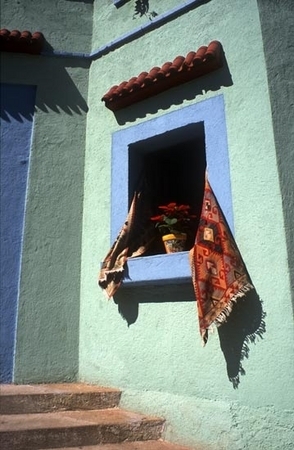 The street is filled with galleries and the facades of the old colonial buildings are painted with wonderful colors. It seemed a little strange that these carpets from Persia were in Oaxaca which is itself a center for fine crafted woven rugs. I think they were intent on making their escape to their homeland.